Unprecedented tsunamic wave of jubilation erupted in major towns and cities across Biafraland on the news breakage concerning the much anticipated Biafra referendum date. 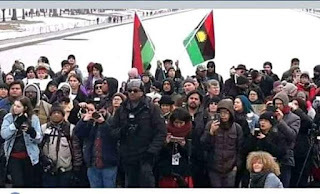 Social media platforms amongst other media outlets experienced heavy traffic on the exclusive Press Release made available to Newsmen by Comrade Emma Powerful, the Media and Publicity Secretary of the Indigenous People of Biafra (IPOB), globally. Recall that the IPOB leadership ably piloted by Mazi Nnamdi Kanu, duly announced Saturday 16th February 2019, as a date for Biafra referendum, to really ascertain the resoluteness and preparedness of Biafrans in their demand for an independent Biafra nation. The unexpected announcement was hundred percent welcomed by Biafrans across Biafran territories as jubilants massively took to the streets to register their approval. Reports reaching Family Writers Press have it that all segments of Biafraland (southeast and Southsouth regions) were hit by ecstasy arising from this awesome development. Crack team of correspondents in Igweocha (Port Harcourt city, Rivers State) have it that Biafran residents in the State capital (Port Harcourt), Bori (Ogoniland) and parts of Kalabari kingdom, happily expressed appreciation for the announcement of the long awaited referendum date. They pledged total support for the exercise, application of method, nonetheless. Contacting her correspondents in Bayelsa State, Family Writers Press also learnt that massive jubilation of residents greeted the announcement at Yenegoa, Brass, Mbiama and Ogbia. Story is not different amongst Biafrans in Calabar, Ikom, Ogoja, Eket and Bakassi peninsula as all the people reacted in the affirmative, awaiting the set date of 16th February, 2019. Reports from Delta State, have it that the joy following the referendum date announcement, was electrifying in Asaba, Warri, Sapele, Ughelli, Agbor, etcetera. Biafrans here pointedly declared their intentions to immediately swing into action by utilizing available time, to adequately sensitise the people in rural communities concerning the upcoming exercise which will culminate in the observation of a complete Sit-At-Home in the course of Nigeria organized presidential election billed for the same day. Other cities in Igboland of Biafra such as Onitsha, Enugu, Umuahia, Awka, Owerri and Abakiliki were not left out in the expression of joy concerning the news. Cross section of residents interviewed, pledged total support to the referendum, come Saturday 16th of February 2019. Correspondents contacted in the city of Aba, Abia State, clearly reported that the Mini Sit-At-Home order given by the IPOB leadership concerning the All Progressive Congress Party (APC) presidential campaign rally, really eroded their assessment of people's reactions to the referendum date announcement. This was because residents of the Enyimba city were completely indoors, dealing with the day's protest. The above reports/opinions sampled from across Biafraland, are attestations to the fact that Biafrans desire absolutely nothing besides the full restoration of Biafra sovereignty. The organized international community should readily prepare to employ all veritable indices within it's jurisdiction to let the world come to terms with the Biafra referendum date of 16th February, 2019. All accredited electoral observers, both local and international, should mandatorily be prepared to give the world, the true and exact picture of what really transpired in Biafraland come that date. As for the referendum exercise, it's conduct and desirability remain essentially sacrosanct and irreversible.